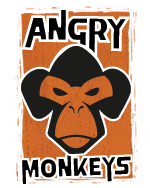 Good news everybody, Angry Monkeys is hiring! The last few months have been a crazy time for Angry Monkeys, so much so that we’re seriously considering a name change to Crazy Monkeys. We've been so focused on doing paid work; we've completely forgotten to work on our own projects. We have a number of world-changing web solutions on the go, but just haven't had the time to get them over the line. Heck, we still haven't gotten around to building our own website! This is making our Angry Monkeys even angrier! So, what to do? Get more Monkeys of course! We're looking for talented, enthusiastic, experienced developers with a keen sense of what makes the web tick. Being a small company (well, there is only me), the role involves a whole lot of responsibility, and a whole lot of opportunity. This is a chance to get on at the ground floor of company that is truly going places (we’re actually on the 13th floor for the superstitious). Most importantly, it is a chance to control the direction of your own future. All applicants will need to display a passion for web development, be able to demonstrate the ability to create cutting edge web applications, self-learn and most importantly, have a serious commitment to quality. We don’t create half-assed solution, and “hacks” are definitely out. Please apply via e-mail to [email protected] including resume, examples of work and references.